This entry was posted on December 20, 2012 by Jessica Anderson. As the holidays approach, life gets hectic, especially for retail industries. Here are some ideas for planning meaningful recognition for your employees before the season hits. 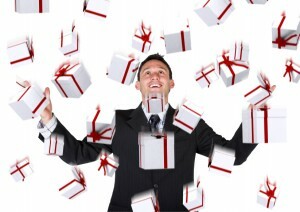 Many companies host a holiday party for staff, including end-of-year gifts, awards and bonuses. It’s important to consider who deserves recognition at this event. Obvious choices include top performers, but also include less obvious choices as well. Below are the five most important people to include at this celebration. Recognizing effort is especially important at the end of the year. This individual dedicates themselves to the organization. They complete extra work without being asked and ultimately make your company money, so acknowledge them accordingly. No one likes employees that abuse their “sick day” privileges, especially when a deadline is looming. Often another employee has to work double to cover the truant one. It’s important to let individuals who never miss a day know how much you appreciate their dedication. Top producers with outstanding sales deserve recognition at your event. The awards you give these individuals should be the most elaborate of the event. Other staff will hopefully feel motivated to become next year’s recipient. Every group has a leader, motivating, inspiring, and teaching other members on the team. Give proper accolades to the leaders in your organization who excel, as they are ultimately the right-hand of your business. Recognize personal assistants, administrative assistants, janitors, and other professionals who make your life easier. The janitor who changes the trash can and vacuums the office every night, the messenger who delivers express packages in time for a presentation, and the guy or gal who changes the sheets at a hospital or nursing home are the unsung heroes who make the organization run smoothly. These people are valuable contributors to your organization and deserve to be acknowledged for all the deeds they do! Be thoughtful and creative with your recognition, as small gestures can bring great results. Don’t let another year go by without saying thank you to those people who keep the company running smoothly.